Italo was personable and professional. His knowledge depth was very detailed, which is exactly what we wanted. He was able to answer all our questions - we didn't want a "fluff" tour. Doing a private tour made our day - we were able to go at our own pace. 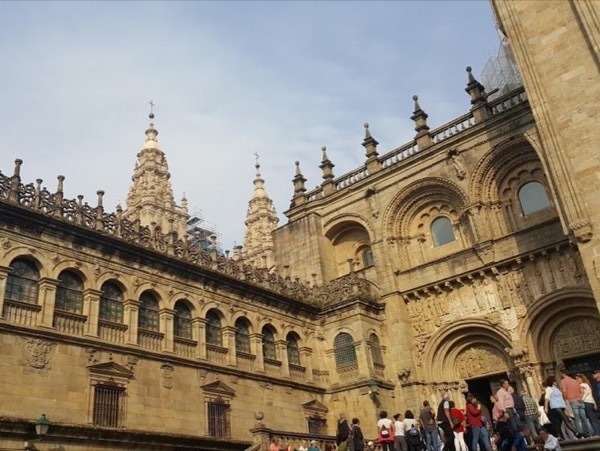 Very informative guide who paced our walking tour with frequent stops to view important historical sites...Comprehensive knowledge of the Santiago de Compostela rite of devotion which draws thousands of pilgrims every year from all over the world. Great tour with Italo. Walked the last 3 miles of El Camino with him. Very inspirational, it gave me a feel for planning our own Camino walk! Italo was extremely knowledgeable and put the Camino in both historical and modern context. While ~ 3km is no substitute for the real thing, it was an extremely informative overview of this important phenomenon. Italo was a great guide and made our trip so rewarding by making sure we saw everything that we needed to see in a short period of time. His command of English is also excellent, and he recommended some great restaurants for us as well. I'd book him any time. Italo is knowledgeable, caring and provided a tour which ticked all our boxes. We learnt much and had so much fun on the way. He catered for my husbands disability with care and consideration. I would have no hesitation in recommending his services, in fact, I would say a must on any visit to Santiago de Compostela! The tour was informative and we enjoyed it. Italo's English is excellent. We did the Tasting the Camino tour with him and it was a very interesting and highly enjoyable 4.5 hours. He catered to our specific interests and really personalised the tour for us. It was well worth the cost and I highly recommend him. TOUR GUIDE RESPONSE: Thank you very much Mrs Hill for your kind words! It was a pleasure for me to share those moments with you in this beaitiful town! My best regards! We had a fantastic tour. When we got there we asked to change it. Italo was very accommodating. He was very knowledgeable about history and the buildings we saw. When we get back again we will definitely book with him. Anyone wishing to see Vigo should use him. I cannot say enough about our tour. During or month long stay in Spain, Italo was our best guide. He walked with us the last few kilometers of the pilgrimage route, explaining the significance of the various stops along the way. A knowledgeable and passionate guide. I would go with him again, but next time on a longer segment of the pilgrimage. We really enjoyed our tour to Santiago de Compostela. Italo is an excellent guide and is very knowledgeable concerning local history and points of interest. The walking pace was very comfortable and Italo adjusted our schedule as needed due to the crowds and the fact that there were some local protests happening that could have impacted our travel time back to the pier. The driver did a great job. I definitely recommend Italo. Italo was knowledgeable and charming and our family enjoyed our tour enormously. Italo presented a great orientation to our stay in Santiago. Italo even helped out with a minor family health crisis. We felt like we had a friend in Santiago! We would recommend Italo to all visitors to Santiago. Italo was prompt and very knowledgeable about the area. We really enjoyed our tour of Coruna and Santiago and would highly recommend him to anyone touring this area of Spain. Italo was excellent. We throughly enjoyed our tour with him. He was well enforced and spoke excellent English. We would recommend him without hesitation.